"My reason for creating them is almost as if I would dance, except this is a much more marvelous dance. It's because in film, I can make the world dance." Maya Deren is one of the most important, and arguably the most influential avant-garde filmmaker in America. In her short life (she died at the age off 44) she only completed six short films with a total running time of less than an hour and a quarter, but many of them were groundbreaking works, breathtakingly original, and her influence continues to be felt today. Deren was born in 1917 into an educated and cultured Jewish family, which emigrated to New York state when she was five. After studying journalism at Syracuse University, she met dancer and anthropologist Katherine Dunham, who would fuel her later interest in Voudoun (Voodoo) and Haitian culture. She met Alexander "Sasha" Hammid through Dunham, married him, and together they created her first, and most famous film Meshes of the Afternoon in 1943. Over the next few years, she became an integral part of the New York avant-garde art circles, completed two more films, and won the first Guggenheim award ever given to a filmmaker. Her interest soon turned to rituals and dance, and she made several trips to Haiti, immersing herself in Voudoun rituals, to the point of becoming initiated in the religion, and eventually writing a book about it. After divorce and later marriage to a man 18 years her junior, and the completion of several more films, she died in 1961, under somewhat mysterious circumstances. Using archival materials, interviews, and text screens, In the Mirror of Maya Deren paints a more or less chronological portrait of this complex and sometimes over-the-top artist. There are clips from most of her films, interviews with many of her friends and associates (including luminaries of the experimental film scene such as Amos Vogel, Stan Brakhage, and Jonas Mekas) and many still pictures from Deren's childhood and later career. The film takes on added resonance in the use of many sound recordings of Deren herself, in which she explains her career choice and why she loved filmmaking, the inspiration for several of her films, and her interest in Voudoun. It's obvious that a great deal of research and preparation went into this film, but perhaps "a great deal" is in this case too much. It's as if director Martina Kudl�cek couldn't bear to leave out a single bit of footage once it was shot, and the result is that we get interesting and informative interviews mixed with others that are marginal, or that go on for far too long and end up in irrelevancy (what does tai chi have to do with Maya Deren?). And she's apparently in love with the Haitian footage, because it crops up again and again to the point of annoyance, often in contexts that have nothing to do with Deren's interest in that country and its culture. With a running time of 103 minutes, the film is unfocused, and one wishes that Kudl�cek would have taken inspiration in the paucity of completed material by her subject, and trimmed a good half hour or so. Image Transfer Review: Quality varies with the source materials, but the new footage looks good, with solid colors, reasonable black levels and accurate flesh tones. One annoyance is that the image regularly jumps a bit vertically, which is especially noticeable on the text screens. Audio Transfer Review: The sound is quite good, with lots of stereo separation and good dynamic range. Avant-garde composer John Zorn provides an interesting score, and thankfully the transfer is up to it. Extras Review: 11m:43s of outtakes from Deren's uncompleted film Witch's Cradle are included, and from the look of the snippets included here, it would have been a fascinating work. Shot in Peggy Guggenheim's Art of This Century Gallery, the footage looks great, better than the clips in the feature. There are striking shots of strings crawling across clothing and strung through space, surrealist objects, an aborted game of Cat's Cradle, and a woman with a pentagram on her forehead. Ensemble for Somnambulists is a trial run for the later The Very Eye of Night, Deren's last completed film. In its 6m:19s we see dancers float ethereally across a night sky as the camera whirls about them. It looks okay, but is quite grainy. Stan Brakhage's tribute Water for Deren is included in its 2m:28 entirety. It's a silent, hand-painted film, and is similar to other works by Brakhage. The insert contains a chapter listing and two pages of notes by Kudl�cek, including a rather dry biography and explanations of Deren's influence on other filmmakers. It's mostly a repetition of what's already in the film, and the first page is printed in dark blue text on a black background, making it nearly impossible to read. 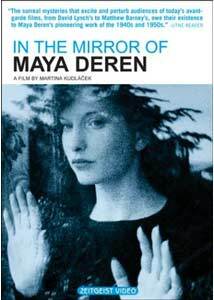 Martina Kudl�cek's In the Mirror of Maya Deren is a biographical study of one of the most important American avant-garde filmmakers., but it's overly long and unfocused. The extras, including a film tribute to Deren by Stan Brakhage, are interesting and most welcome.